Whether you’re looking for tropical beaches to lounge on or jungle adventures to get your adrenaline pumping – zip-lining through monkey-filled tree tops, anyone? – Costa Rica has something for every bride and groom. Best of all, you can totally traverse both spectrums during your destination wedding. Sip tropical drinks on the dazzling beaches of Jaco one day, then cruise over to the breathtaking Arenal volcano the next. Just be sure to plan enough time to soak up the lux hot springs while you’re there! Oh, and why not spring for a mud massage, because hey, you only get married in Costa Rica once, right? 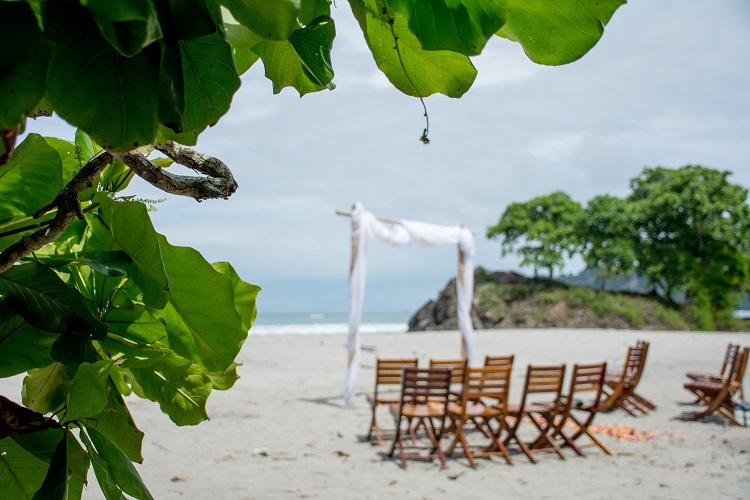 If you haven’t already gathered this, let us be clear: Costa Rica is a magical place to get married. In fact, there’s so much to do there, you’ll have a hard time figuring out how to fit in the many natural wonders it has to offer. 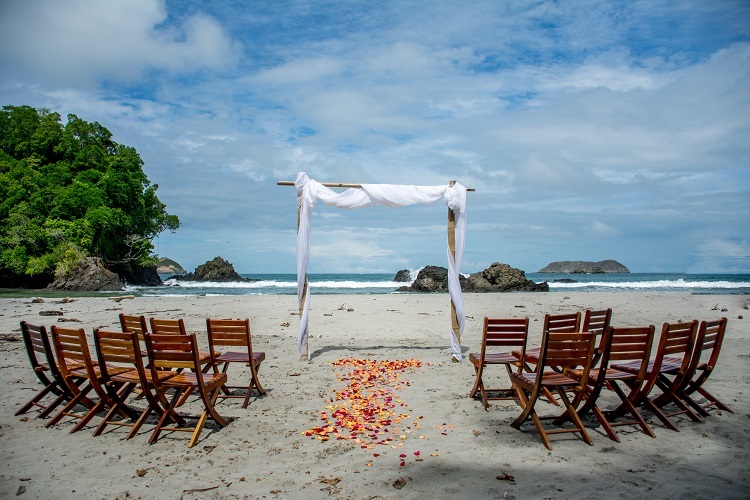 But perhaps there’s nothing more spectacular in Costa Rica than its beaches, making them a dreamlike wedding destination. Of course, planning a beach wedding presents challenges unique from more traditional indoor (and even other outdoor) ceremonies. The biggest is simply being at the mercy of Mother Nature: something that, no matter how meticulous you plan, you simply can’t control. But for Ticos (Costa Rican’s affectionate name for themselves) pura vida is more than just a slogan – it’s a way of life. And so, the best way to overcome whatever unexpected challenges your beach wedding may present? 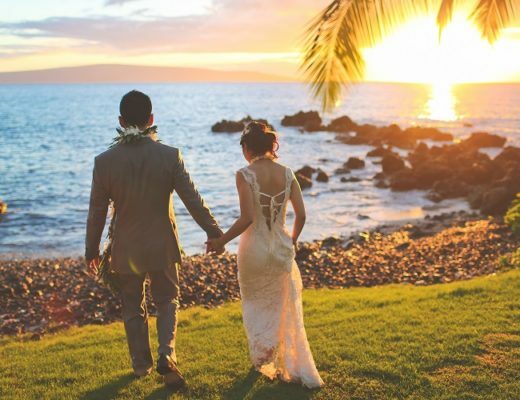 Channel the simple beauty of pura vida with a smile and breathe of fresh salt air… and be sure to read through our jam-packed guide below, which is full of everything you need to know to make sure your beach wedding goes off without a hitch. Costa Rica is a truly remarkable place. Its people are considered some of the happiest in the world. They also have one of the highest literacy rates around the globe, thanks to their focus on education for all. It’s a very peaceful nation. In fact, they abolished their army in 1949 and haven’t looked back since! As such, Ticos pride themselves on being laidback, happy, and calm. Though they may be a small nation (smaller than West Virginia, with a population of only 5 million people), Costa Rica is rich in culture, biodiversity, and plenty to do for tourists. They’re passionate about the environment (a staggering 25 percent of their land is preserved as national parks or wildlife reserves) and creating a country where people, flora, and fauna can thrive. Despite all of this, Costa Rica isn’t a utopia. The country has its fair share of problems, just like every other nation. However, most local folks with tell you that crime, while at times unavoidable, can be limited by simply being a smart tourist. This includes not walking alone at night, even on the beautiful beaches. Money should be kept out of sight, as should jewelry. Only use official Costa Rican taxis—you can tell them apart from the pirates (unofficial, unregulated private taxis) thanks to their red car and yellow triangle atop the roof. On the other hand, official airport taxis are orange, and are the only ones authorized by the government to do airport pick-ups/drop-offs. Overall, these are all typical measures one should take when traveling anywhere really, so don’t let them give you a fright when planning your big wedding day (or week)! Volcano Arenal – This magnificent volcano offers a stunning view, surrounded by lush green pastures that seems to go on forever. 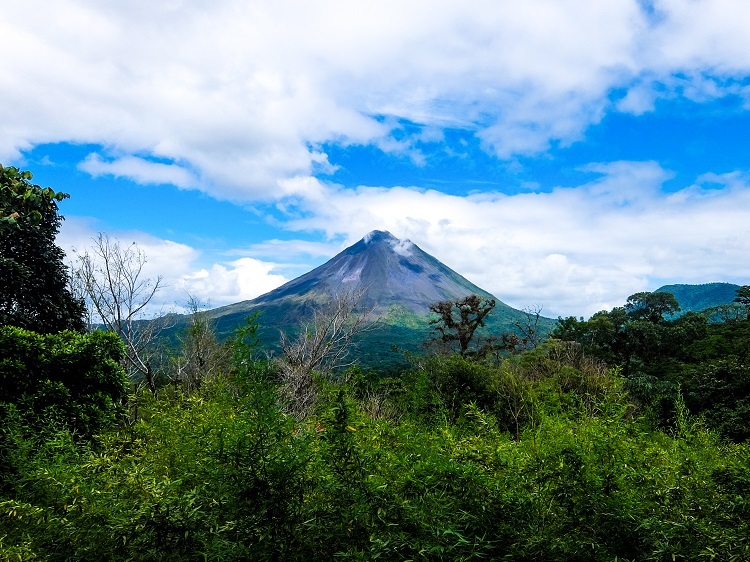 Arenal stopped erupting regularly in 2010, but it’s still worth a visit, especially if an afternoon bathing in the natural hot springs surrounding it is alluring. Heated by the geothermal activity of the volcano, the hot springs are surrounded by exotic trees and greenery. Montezuma – Known and loved for its bohemian vibes, the sleepy beach town is considered off the beaten path. That said, you can still get there by bus (about six hours) or opt to drive. The town offers plenty of restaurants and cafes, but it’s the beaches that draw people here. Surrounded by jungles, the beaches of Montezuma offer pristine white sand and the chance to enjoy a view of monkeys and exotic birds. Manuel Antonio National Park — It’s easy to see why Manuel Antonio is considered a paradise within a paradise. 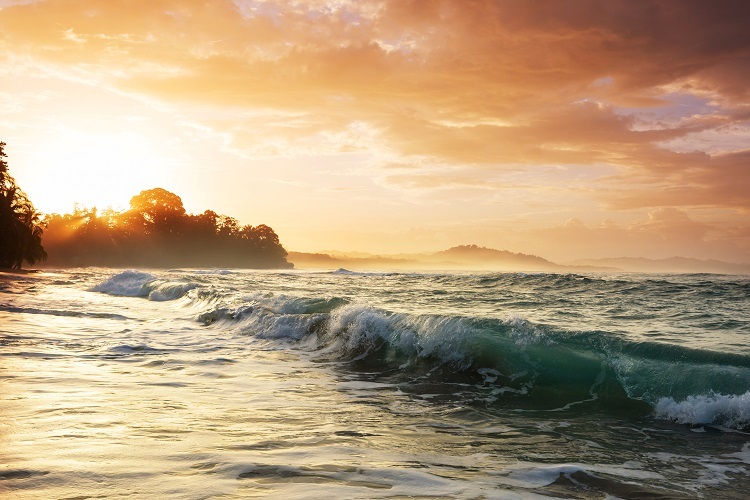 Backed by rich evergreen forests, the beaches are simply some of the best Costa Rica has to offer. You can spend the morning hiking through its wildlife-filled trails, then lounge on the most gorgeous beach you’ve ever seen come afternoon. Not a bad way to spend a day! Relax at one of the many day spas and retreats to help relax and rejuvenate before your big day. Many spas on this list include the additional treat of natural hot springs as part of your treatments! Gather your adventurous group and head out to a jungle or mangrove tour. The hard work of hiking is rewarded by astonishing views, as well as getting up close and personal with all kinds of wildlife and exotic flora. The year-round tropical climate means heat is part of daily life in Costa Rica. Cool off by spending the day whitewater rafting – no experience required. For those new to rafting, your guide can lead you to lazy-river type waters. And for those looking to pump their adrenaline, there’s plenty of Class V rivers to zip through on your raft! Costa Rica is world famous for its surfing. With 800 miles of coast and 300 beaches, it’s not hard to see why. Whether you’re heading down with a pack of seasoned pros or never stepped on a surfboard, you won’t have a problem fitting in, especially with all the surf lessons readily available in most beach towns. A local officiant must marry you. The easiest way to do this is to choose an officiant who is also an attorney. Use a reputable officiant/attorney, as they actually wield a fair amount of power. They’ll be responsible for submitting your official documents to your consulate. This is imperative to ensure the ceremony is legally binding. Costa Rica is a historically Catholic country – in fact, it’s the state religion and over 75% of the population identifies as Roman Catholic. As such, there is no shortage of Catholic churches in this small nation. However, actually getting married in one can be tricky. It requires a lot of paperwork, and possibly even pre-marital classes. For these reasons, many folks opt out of this option. But if you have your heart set on a Catholic church as your wedding location, some advise having your local parishioner reach out to the Costa Rican church you’d like to be married in with plenty of advance notice. There’s a chance you may be able to take care of requirements like classes ahead of time that the Costa Rican church will essentially transfer and accept as if you did it with them. Another option for your destination wedding is to do a symbolic ceremony. This doesn’t have to be any different than a legally binding one as far as the actual ceremony goes; however, it simply won’t be legal when you return home. If you chose to do a symbolic wedding, you won’t need to worry about having an attorney, as there’s no need to file any official paperwork. If you choose to marry at a resort location, as most couples opt to do, the resort will provide a justice of the peace to perform the ceremony as part of your wedding package. Although, since there are no legalities to a symbolic ceremony, anyone can perform it for you—your best friend, favorite aunt, etc. You have complete freedom to do as you please since you’re not involving any government in your union. Really, a symbolic ceremony is about as hassle-free as you can get when it comes to a destination wedding. That said, just because you have the freedom to add in any quirks you want, doesn’t mean you have to! In fact, you can totally have a traditional ceremony that follows the same standards and protocols of a legally binding ceremony – including signing a (non-legally-binding) marriage certificate. For some couples, this is really the best of both worlds. They get a beautiful, traditional ceremony, but don’t have to fret about paperwork, lawyers, and government rules. Getting married is expensive, there’s no way around that. This is one reason so many brides and grooms opt for a destination wedding. The cost is usually much lower than a traditional wedding at home, even with the addition of travel costs. The burden is significantly lessened for the bride and groom, since guests typically pay their own travel costs. The actual ceremony cost looks higher, at an average of $200-400 per guest*. But don’t let that number frighten you. The average cost for a 40-person Costa Rican wedding is only $8,000. Or, a 20-person entourage can be done for under $5,000. The average U.S. wedding cost? A staggering $25-35,000! Of course, a home-based wedding typically involves many more than 40 people, so the price comparison isn’t completely side-by-side. Even still, the savings of a paradise-located wedding is a dream in itself! Many brides and grooms like to DIY parts of their wedding. Not only does this add a personal touch but it’s usually considered a good way to save costs. 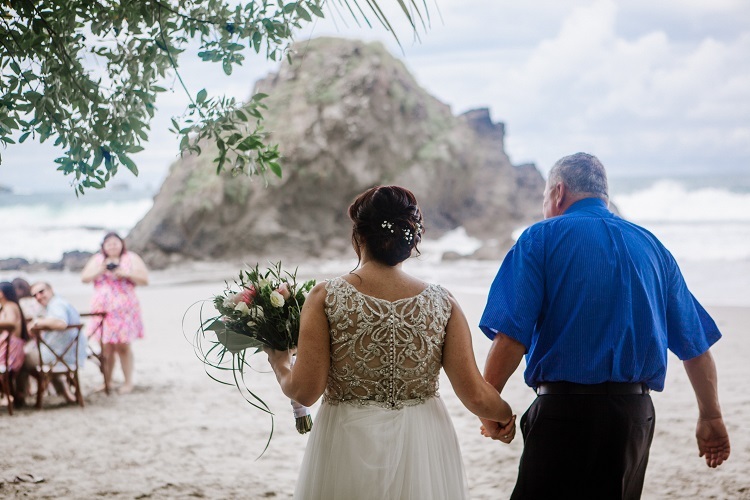 While you can certainly go this route with your Costa Rican beach wedding, some things are simply best left to the professionals. The added complication of traveling with anything you DIY (not to mention extra fees for luggage, and the risk of it getting lost), may be too stressful to deal with for many people. Luckily, Costa Rica has no shortage of wedding planners who you can work with to make sure your day is as unique and special as your love. Perhaps one of smoothest ways to pull off a Costa Rican wedding is to go with a resort wedding package, which will provide everything you could want for your special day. At DestinationWeddings.com, we partner with some of the best, most highly coveted resorts in Costa Rica. Every detail will be attended to by you dedicated wedding planner, and guests can relax and simply enjoy their time in Central America, as the resort will have everything they need to relax and relish in the wonders of this beautiful country. Even with the help of an expert wedding planner, there are still many items that will fall to the responsibility of the bride and groom. These mostly include anything you plan to bring with you to Costa Rica, such as your wedding dress, suit, and party favors. Our advice? Bring as little as possible for the wedding. Your dress will be stressful enough to handle! Speaking of The Dress, most brides avoiding checking theirs as a way to prevent the possibility of it getting lost. Make sure to put it in a garment bag, and a sturdy carry-on case. Remember: A steamer can go a long way in fixing and wrinkles from traveling. Don’t be afraid to speak up to the flight attendant. They may do you the favor of placing your dress in either a closet or allowing you to lay if over an empty seat. Ditch the stateside party favors by planning ahead to something Costa Rican-appropriate. Little bags of local coffee or treats are the perfect takeaway for guests, and save you having to lug them on the plane. Many bridal parties ask that guests forgo wedding gifts, instead considering guests’ attendance a gift (and certainly more expensive than a typical wedding present). That said, if you think some guests will insist, consider asking for experiences you can use during your trip. Gift certificates to hotels, restaurants, spas, and other adventures are a great way to lessen the costs of your wedding trip, as well as avoid having to carry anything extra home with you. Playa Manual Antonio is one of Costa Rica’s most popular beaches. Events are regularly held here, and for good reason. It’s a stunning location of blue-green waters surrounded by lush greenery. 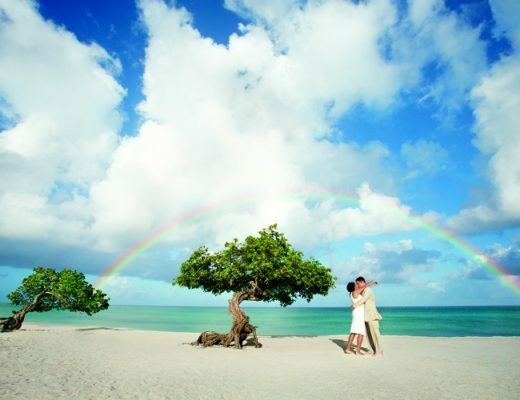 The “secret” beach of Playa Barrigona offers the chance for a romantic wedding truly off the beaten path. Accessible via bumpy dirt roads, this is best suited for the adventurous couple with a like-minded, (very) small wedding party. The pay-off? You’ll likely have the beach to yourself, including the panoramic views it offers. Booking your beach ceremony is a breeze with the help of your wedding planner—typically part of your resort package. They’ll make sure everything is fitted to your taste, ensure guests are comfortable, and allow you to just relax…and get married! For this reason, almost all couples opt to get married on the gorgeous (and well-kempt!) resort grounds. This can include the beach or flower-filled gardens. You’ll get a lovely nature-centric wedding that is meticulously planned, prepped, and prepared for your special day. As mentioned above, Costa Rica is considered a tropical climate. It boasts an average of 12 hours of sunshine each day, with temperatures ranging from 70-80 degrees Fahrenheit. That said, Costa Rica does experience micro-climates in its many diverse locations. For this reason, it’s best to consider the specific climate of your wedding location. If you use a vendor, they’ll be able to provide a contingency plan should bad weather arrive on your day. If you’re DIYing your wedding, our best advice is just to relax and go with it. Postpone for a few hours, or even a day or two if you must in order to avoid poor weather conditions. Since Costa Rica is mostly sunshine, it shouldn’t be long before the sun reappears. Be sure to mention weather to your guests on your invitations or wedding website. No one should suffer in a hot suit during your ceremony! Linens, cotton, and other breathable fabrics are a much better choice for guests to ensure their comfort. 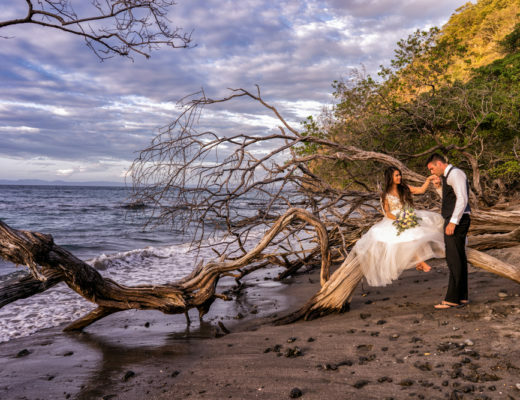 We hope this guide has shown you the range of beauty and opportunity a destination wedding in Costa Rica can provide for you and your guests. This sunny paradise is something everyone involved will always remember. Pura Vida!